With Down Line Builder, Paid To Click, URL Rotator & More. With a stable modern manual surf bar and responsive web site template our Manual Surf Script makes starting your manual surf traffic exchange easy. You will be able to sell a variety of products to Your Manual surf traffic exchange members. You could be selling products such as Paid To Click Advertising, Manual Surf Credits, Account Upgrades, On-site Banner Advertising, Banner Impressions, Surf Start Page & More (all pre-added so you can start selling immediately). The Manual Surf Script is packed with some truly great features such as a great on-site ad rotator, contest system, paid to click system and a lot more. Order Your Copy Of The Manual Surf Script Today And Download Instantly! Why Manual Surf ? well Manual Surfing is different to Auto Surfing, A Manual Surfer has to be present to view each site then click the correct image to earn credits, where as an auto surfer can leave the auto surf system running with out having to actually sit in front of the screen viewing the sites. With this fact allot of advertisers prefer Manual Surf Traffic Exchanges over auto surf's as they know that their sites are actually being viewed by someone on the other side of the screen (an actual person). You can start your very own manual surf traffic exchange today and provide a service that advertisers are actually looking for! With this Manual Surf Traffic Exchange Script your sites, blogs and affiliate offers could be receiving hits from hundreds if not thousands of potential customers / leads every single day. Just think how much it would cost in time and money if you were to drive that traffic to your sites from external sources. 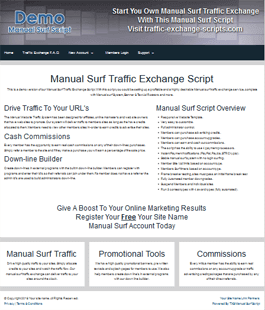 Our manual surf traffic exchange script offers you a great opportunity to start your very own Manual Traffic Exchange where you can advertise all of your sites, banners and text ads for free. One of the best parts of this Manual Surf Script is that for a strictly limited time the Manual Surf Script is being offered in an UN-encrypted format. Our competitors are selling a similar but encrypted types of PHP Manual Surf Traffic Exchange Scripts for approximately $150 - $380+. Do Not miss out, Get your Manual Surf Traffic Exchange started for a price that is lower and have peice of mind knowing you can make changes to the manual surf scripts source code as needed. Members can manual surf for credits. Assigning of manual surf credits. Releasing of manual surf credits. Purchase additional manual surf credits. Setting of bonus manual surf credits for new members. MYSQLi & PHP 5.6+ installed. The manual surf script makes use of an additional points system (that can be disabled). Your members will be able to earn points for surfing, as contest winnings or earn them in bulk by completing CPA tasks via multiple offer walls, where your members earn a set number of points for every dollar you earn. Points can then be used to purchase on-site advertising, upgrading of accounts etc. 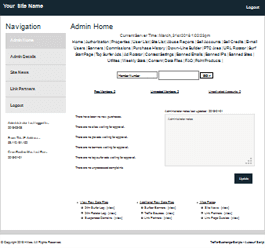 Administer your manual surf traffic exchange via a built in administrator back-end or create sub admin accounts. "The script is amazing. Huge potential for combining traffic exchange, PTC and other forms of advertising. Clean, adjustable and easy to use both for customer and admin. State of the art support, professional and responsive. No need to be IT guru to use it and tweak up to your individual taste. As promised looks great on any device. If you don't want to spend a fortune and run a professional advertising business this is your number one choice!"